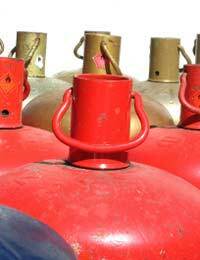 Many householders in the UK have the luxury of gas supplied through a mains pipe, and receive a monthly bill. For those who don't, gas must be bought in containable units stored in canisters, and continually replaced when the canister runs out. This can also be an advantage, as the customer knows how much gas is being bought, and at a set price. Often, a gas company or local supplier will deliver and replace canisters for households, and will fit it to the connection tap on the outside wall. When a supplier provides this service, it is easy to forget about any environmental consequences, such as waste products and recycling. Some of the local gas suppliers will be able to simply take the old canister away and refill it, but this isn't always the case. Despite looking like indestructible metal containers, the steel canisters don't last forever, and often need to be inspected for damage, wear and tear, or rust, that could deem it un-repairable and un-refillable. However, throwing them into landfill sites isn't a sensible option, due to their bulk, and very slow potential to rust and contaminate. Why throw away something just because there isn't an immediate recycling option? Because of the specific design and function of most modern gas canisters, there aren't so many recycling options, unless an individual is willing to get creative with a steel saw and a soldering iron! The first option should always be to try to return the empty canister to a local gas supplier, who sold it in the first place. They should accept the empty canister, and if it is unusable, be able to return it to their supplier.If, for whatever reason, they are unable to accept an empty canister back, try other local gas suppliers. Alternatively, ask at the local Recycling centre in the local area. The address for this will be available from the Local Council. Staff at local Recycling Centres will either be able to accept the empty gas canisters, or give further advice or recommendations. One of the most inventive uses of empty gas canisters is to turn them into wood burning stoves. This involves cutting into them to create a door opening, on a small hinge, to put wood and coal inside and to remove the ash, and then soldering on some feet to keep the unit stable. This creative use of empty canisters is quite common in rural Ireland, where traveller communities have made use of the empty canisters, and often turned this creative recycling into a profitable business. Other options include storage units of some kind, or even cutting them in half long ways or length ways to create a flowerbed. Again, this involves a fair bit of cutting and soldering, and is quite time and labour intensive, but can be well worthwhile, if creative solutions are found to the burden of having empty canisters lying around in an un-refillable condition.